Rannveig’s Fast is actually fairly fun to go through. You can avoid a lot of trouble and time with this guide though so make sure you read the whole post before you start this dungeon. Inside the pass you will find a few easy enemies that you should have no problem with dispatching off. Then you get to Ranveig’s Fast. Inside it will seem as though the word of power is very close, but in the passage just in front of the wall that has the word written on it there is a trap door that will activate when you walk over it. Walk on the right or left of it on the slightly elevated rock to avoid falling down, collect the treasure and learn the word of power and you are good to go back outside the dungeon. However, I like to explore caves to their full extend. You have two options of doing this. The first is that you can walk into the trap on purpose which will mean that you fall into a cage below which you either have to lock pick open or kill Sild the Warlock and get the key off his dead body. The lock is an expert lock which may be difficult to pick if you don’t have a large supply of lockpicks. The way I like to keep exploring is by going down the cave which you would normally have to walk up to get to the word of power. This way you can explore without being trapped and surprise slid with an arrow in the back. 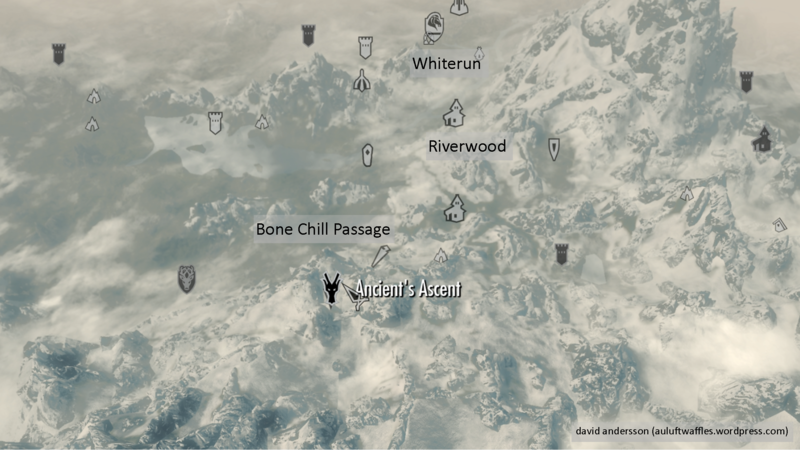 This entry was posted in Gaming, Kyne's Peace Shout, Skyrim, Words of Power and tagged guide, help, Kyne's Peac, peace, ranveig's fast, shout, skyrim, tips, tricks, tutorial, walkthrough, word of power. Bookmark the permalink.